"Baikal" redirects here. For other meanings of "Baikal", see Baikal (disambiguation). Although there were muted protests, a wood pulp and cellulose processing plant was built at the south end of the lake (at Baykalsk). The plant still pours industrial effluent into Baikal's waters. The overall impacts of watershed pollution on Baikal and similar watersheds are studied annually by the Tahoe-Baikal Institute, an exchange program between U.S., Russian, and Mongolian scientists and university graduate students started in 1990. ^ Lake Baikal: the great blue eye of Siberia. CNN.com. Retrieved on 2006-10-21. ^ The Oddities of Lake Baikal. Alaska Science Forum. Retrieved on 2007-01-07. ^ Deepest Lake in the World. geology.com. Retrieved on 2007-08-18. ^ Lake Baikal - World Heritage Site. World Heritage. Retrieved on 2007-01-13. ^ Travel to Baikal - Olkhon Island. Retrieved on 2006-10-22. 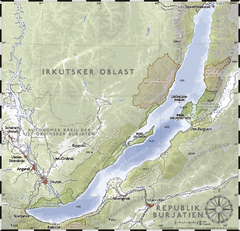 ^ Lake Tahoe and Lake Baikal Watersheds. Tahoe-Baikal Institute. Retrieved on 2006-10-21. ^ Lake Baikal - A Touchstone for Global Change and Rift Studies. U.S. Geological Survey. Retrieved on 2006-10-21. ^ Tahoe Baikal Institute Tahoe-Baikal Institute. Retrieved on 2006-10-21. ^ Transneft Transneft. Transneft. Retrieved on 2006-10-21. ^ Baikal Environmental Wave. Retrieved on 2006-10-21. ^ Greenpeace. Retrieved on 2006-10-21. ^ Baikal pipeline. Retrieved on 2006-10-21. ^ The Right to Know: Irkutsk Citizens Want to be Consulted. Retrieved on 2007-01-07. ^ Тема: [ENWL Власти Иркутской обл. выступили против прокладки нефтепровода к Тихому океану]. Retrieved on 2007-08-03. ^ Putin orders oil pipeline shifted. BBCNews (April 26 2006). Retrieved on 2006-10-21. ^ Transneft charged with Siberia-Pacific pipeline construction. BizTorg.ru. Retrieved on 2006-10-21. ^ New route. Transneft Press Center. Retrieved on 2006-10-21. Baikal Club International Blog (in English) Articles about the Lake from people from all over the world. Travel to Eastern Siberia region and to lake Baikal. Trans-siberia adventure tours and baikal lake travel at baikal area, siberia, russia. Siberian dog-sledding in deep taiga and on Baikal ice as the additional winter adventure activity during the sightseeing tour to Listvyanka village. On the merits of magnitude alone the lake is renowned as one of the earth's most impressive natural wonders, and rightfully so--Baikal is so large that all of the rivers on earth combined would take an entire year to fill it. The lake region is home to an enormous variety of plants and animals, most of which--like nerpas,the lake's freshwater seals, and its trademark delicacy, the omul salmon-- are found nowhere else in the world. Lake Baikal long ago became famous for the purity of its waters and surrounding shores, a pristine state that had been seriously threatened by planned industrial development in recent years.